The bedrock of Molecular Gastronomy is the idea that you can re-engineer dishes into something new and fun in taste and texture – a sort of Alice in Wonderland meets Bill Nye the Science Guy meets Emeril. One of the best examples is in creating gels with AgaZoon, our feature this week as Molecular March continues. Creating gels isn’t necessarily new; in fact, some place its origins as far back as 17th Century Kyoto, when Tarozaemon Minoya observed a dish made of “boiled seaweed left to freeze and thaw several times formed a substance presenting gelling ability.” Current applications are far-reaching – apart from the classic Jell-O dessert, we were able to make Concord grape “pasta” earlier this week. Working with a product like AgaZoon requires simple ingredients and a keen eye (the mixture must reach a boiling point, then be immersed in an ice water bath to set to produce the transformation.). Many recipes simply call for a liquid and AgaZoon (and the above-mentioned hot/cold manipulation) to produce gels. So just what is AgaZoon? 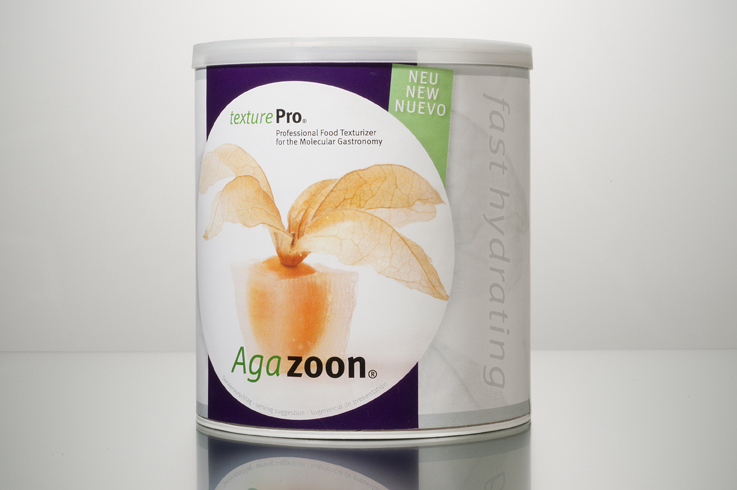 AgaZoon is a product derived from agar agar, a polysaccharide gelling agent found in seaweed vegetation like red algae. As it is not made from animal products, it serves as a good vegetarian alternative to traditional gelatin. Even if you’re not a vegetarian, AgaZoon has a wider array of uses – it produces a stiffer solid when used to form a gel, leaving the user with more options for shaping and cutting. Our friends at Culinary Imports are a veritable fount of creative ideas for all their products, and this is no exception. Witness their faux sushi (pictured at left), made with thinly-sliced salmon, inoki mushrooms and mock rice. In lieu of white rice, which doesn’t have a ton of nutritional value, the Culinary Imports team formed a coconut AgaZoon gel block and shaved it into little “rice” grains. How cool is that?! There are other, simpler applications for agar agar, such as thickening sauces or dessert dishes like ice cream. Additionally, pâtés and other ingredients are often traditionally packed in a gelatinous consomme to form an aspic, as in the photo to the right. 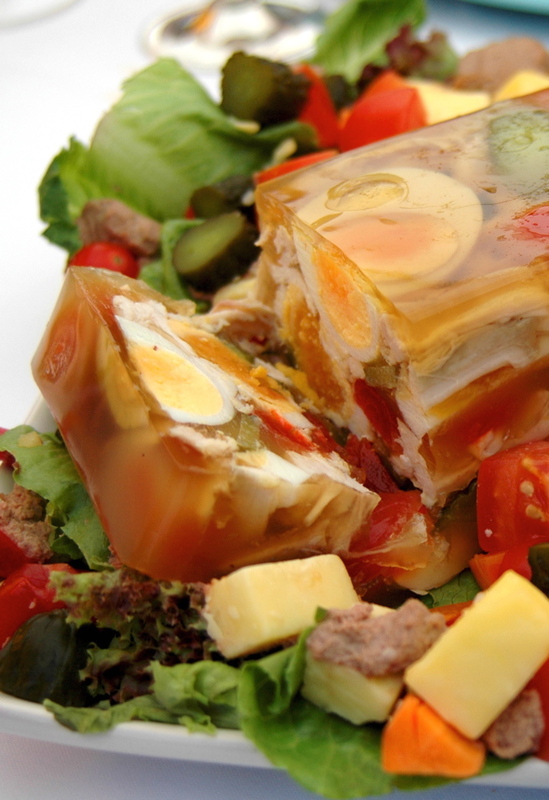 AgaZoon gelatin can serve as a meat-less substitute, and works just as well. Stop by the store this weekend and we’ll show you how to use AgaZoon to create interesting tastes and textures, adding a special twist to a meal. 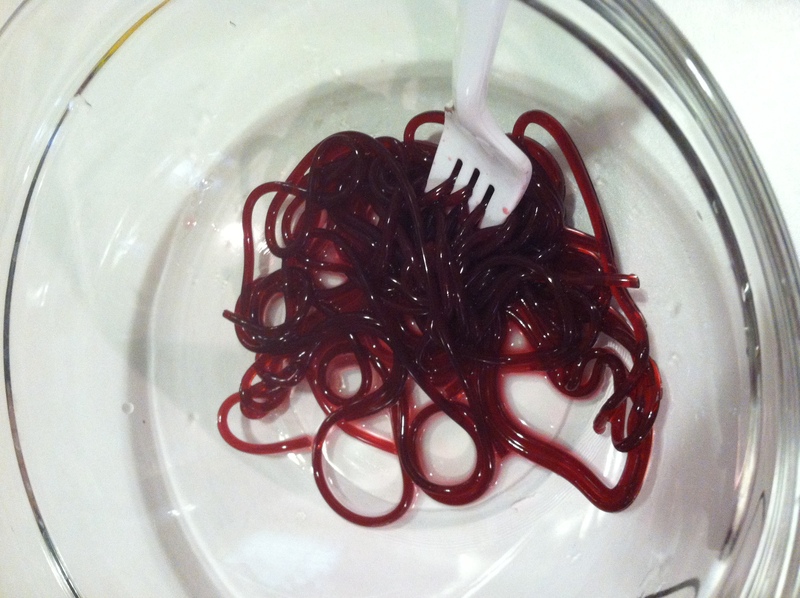 We’ll have gel blocks as well as faux noodles like the grape juice noodles pictured below. And there’s a lot more you can do with AgaZoon at home – the only limit is your imagination! There’s only two more Saturdays left in Molecular March, so if you haven’t had your fill of food science yet, this is one of your last chances. See you there!